Around the start of the year I got sent a blast e-mail which offered some pretty good discounts on various OnHillEvents for the year of 2019. I had done the race last year and it is just a short 2 mile drive from my house. So it was a pretty easy decision to do this one. Last year, though, I had dug myself into a bit of a racing hole. 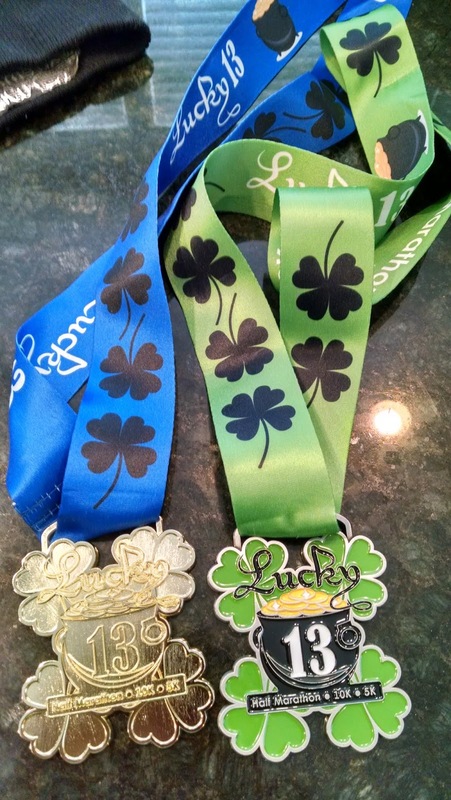 I had done WAY too many half marathons. I think in the early spring I did about 6 or 7 half marathons in the span of 7 weeks. Mid way through I was feeling beat up and this year I didn't want to have a repeat. 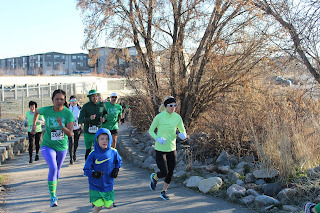 So I've dialed it back a bit this year and opted for the 10KM this -- and boy I am glad I did. I definitely don't feel as run down as I did last year. I had picked up my bib the night before, so the whole process of getting ready for the race was as easy as it gets. I got there just shy of 8:30 for the 9 AM start. I circled around and took some photos, used the rest room (funny how I have to go even after a 2 minute drive from my house) and then did some drills to warm up. It was kind of chilly and I opted to run in shorts, 2 shirts, and throw away gloves. I also ran with sunglasses and a hat. It was perfect, although I got a little warm mid way through the race despite the upper 30's / lower 40's running weather. The race started a little late, but no biggie. Joseph the race director had said he had a big turnout and he wasn't kidding. 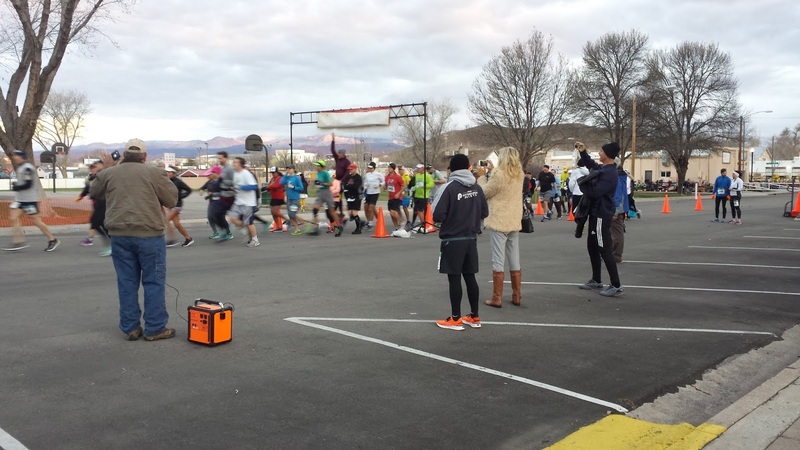 Last year, the number of runners were kind of thin. This year, he had a good contingent of them. I inched my way to the front but not too close. From previous race experiences on this course, the race gets pretty jammed at the start but opens up soon enough. It all depends upon how many newcomers there are that sort of start up at the front. 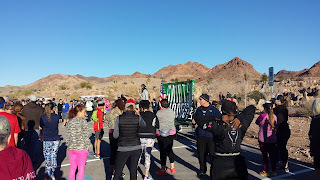 I hadn't done much of a warm-up before the race so I sort of eased my way into the first mile. In some ways I was glad to be hemmed in because it forced me to ease into the race. 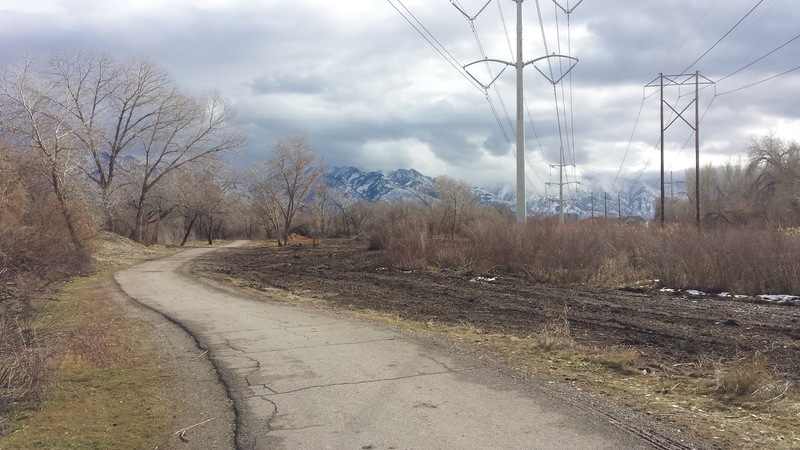 The race is held on the Jordan River Bike trail, which is my stomping ground for training. However, I live about 2 miles north of the starting line and I almost run north when I run on it. This race goes south and the bike trail is largely flat with no significant hills. There are plenty of twists and turns but generally speaking -- you run south for 3.1(-ish) miles and then turn around. I was pleasantly surprised to see the first mile go by fast. I felt like I was running hard but not that hard. I was worried I had started too fast and that the last 3 miles would be a crash and burn scenario. 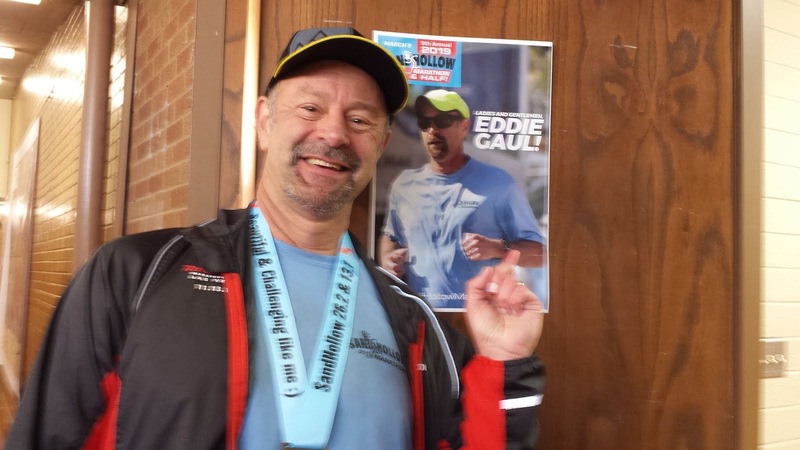 Having just run a half marathon a week before, I knew that I had plenty of endurance. The 10KM is such a nice distance. It is a mix of hard running (speed) while still you need endurance to finish. I was again surprised (and happy) to hit mile 2 even faster than mile 1. I could feel a little bit of lactic acid building up in me but overall I felt good. I was wearing my Saucony Fasttwich shoes and I actually felt light on my feet. And, I was still working with other runners. Just before the halfway point of any race -- particularly one with an out-and-back profile, I desperately can't wait to hit the turn around point. It is a mental relief as well as I know how much more I have to go. I figured I was going to top 10 the race. I didn't see anyone in my age group and there were only a handful of other runners ahead of me. The leader of the race was well ahead, but I had a few people to work off of in front of me and a few chasing me from behind. I was hurting by the time I got to mile 4 but still felt good. I looked behind me and there were a few runners behind me but not lots. So I wasn't too worried about losing my age group lock. At 4.5 I went through the first aid station again and I was still holding a pretty solid pace. The last mile did eventually catch up with me. I had two runners trailing me and I was doing my best to hold them off. One was a woman and the other turned out to be much younger man. I think they were using me as a pacer and in the last .2 of a mile they both gunned by me and I had nothing left to give. Also the final mile involves a lot of zig-zagging and tight turns. There is also a very short but painful hill as you get into the parking lot of Gardner Village -- the boutique shopping area that hosts the race. I tried catching them but they clearly had another gear in them. I crossed the line in 50:32 (on my Garmin). 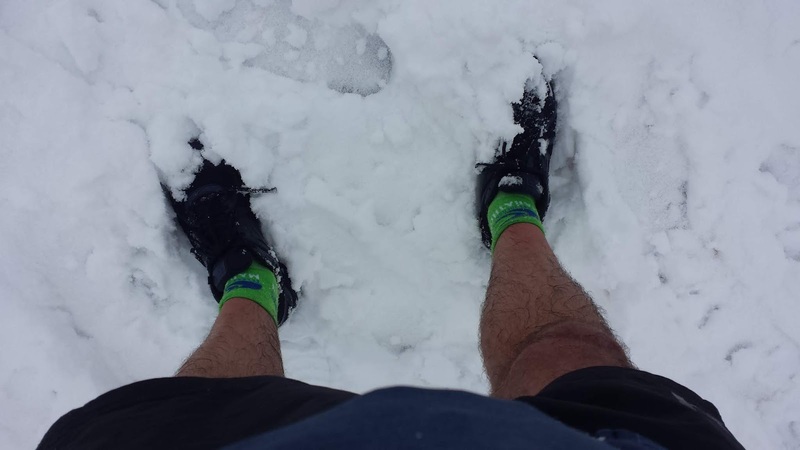 I talked to another runner who said he ran 6.10 miles. 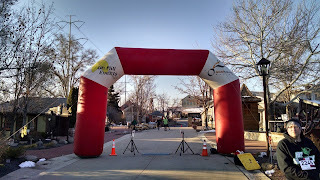 The race was most likely short, so I am guessing on an officially measured course, I'd be just shy of 52 minutes. I was pretty happy with my time. I ran well and with the exception of the last mile, my splits were more less very consistent. Usually I start out WAY too fast and then shuffle through the finish line. 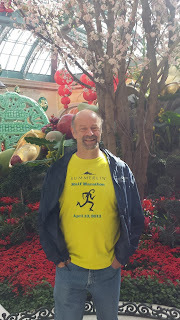 With all my endurance training, it is nice to step down to a shorter distance. I grabbed my finisher's medal and I wasn't too surprised to see I had won the 45 - 49 age division (last year the half marathon in my age division was super stacked). 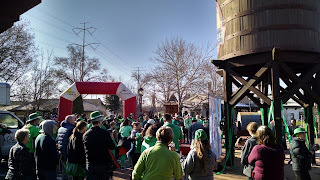 I wound up socializing with several runners after the race. We were all commenting about how nice the weather was. I kind of wish the weather remained this nice throughout the year. It was absolutely perfect for a fast run. The post race refreshments included sports drink, candy, oranges, sandwiches, bananas and of course Fat Boy Ice Creams. I wound up loading up on those... they taste absolutely heavenly after a race. I don't remember exactly what I paid for the race, but since I was early it was pretty cheap. I definitely got my money's worth. 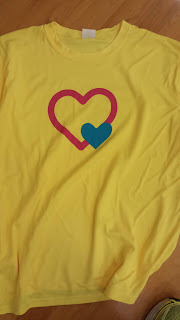 The shirt was nicely designed although it was another cotton / polyester blend. I am not sure what to make of them as I definitely prefer the 100% polyester shirts for training. I'll wear it, but probably not for racing. While the course isn't unique or new, it is a fast one and I enjoy it. There is something comforting about knowing just about every twist and turn on a course. I am just pretty happy with the results and I hope this streak continues. 7 9:31 Crested the hill. Now for some down hill. Sort of surprised this mile wasn't slower. 9 9:02 Back to the flat section. 11 8:35 Sense the finish line is coming. Actually holding up really well. I am a repeat customer to the Sand Hollow Half Marathon. It is one of my favorite and quite affordable. With the race season just starting off, this is an opportunity to race in better weather (i.e. warmer than Salt Lake City) in a part of the state I'd like to visit more often that I do: Southern Utah. 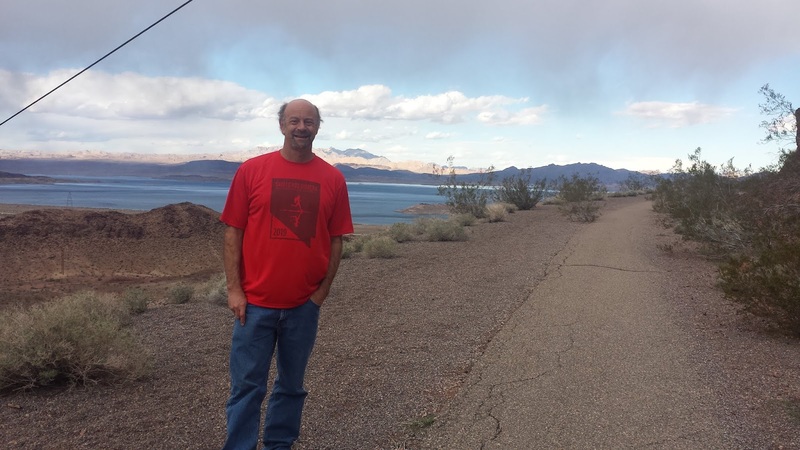 There is a lot to do down in Southern Utah. It also usually kicks off a weekend in Mesquite, NV where I can get my Jacuzzi and buffet on. 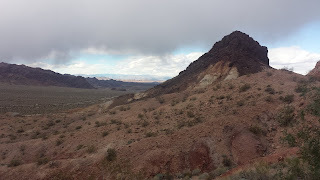 Southern Utah also offers a bigger contrast over northern, as there are a bunch of national parks and beautiful red rock formations. It was quite an adventure down to Hurricane when I left on Friday. I ducked out of work a little early. I had heard there were warnings of some snow flurries but none of the weather sites seemed to be too alarmed by it. Well by the time I got about 90 minutes out of the city, it started to snow. 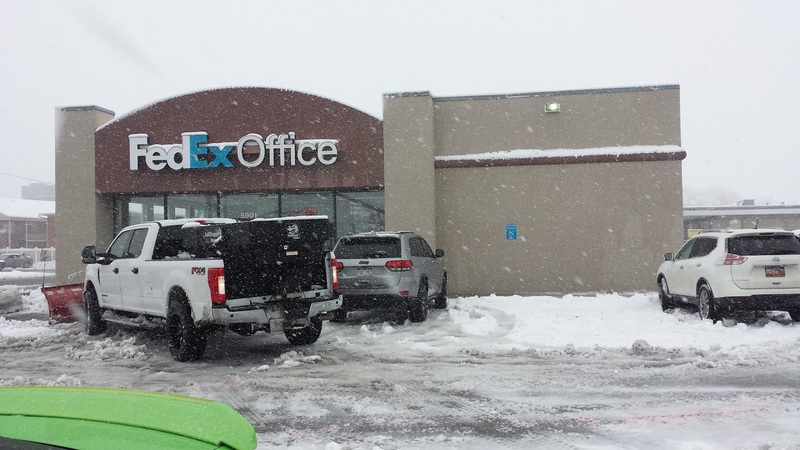 It wasn't necessarily sticking but it did make driving a little more nerve wracking. The central part of Utah doesn't have a lot of civilization and I was really worried about driving into a ditch. I saw at least a dozen cars, some of them in really bad shape, off in the ditches. I didn't want that to be me. All told, it probably took me an additional 45 minutes to get to my destination. I was so stressed from the drive that my muscles almost hurt. I stayed at a hotel down the street from the race and rolled in about 40 minutes before the start. I nabbed a really good parking spot. I had picked up my bib the night before so I was all set to run. I was a bit apprehensive about this race. 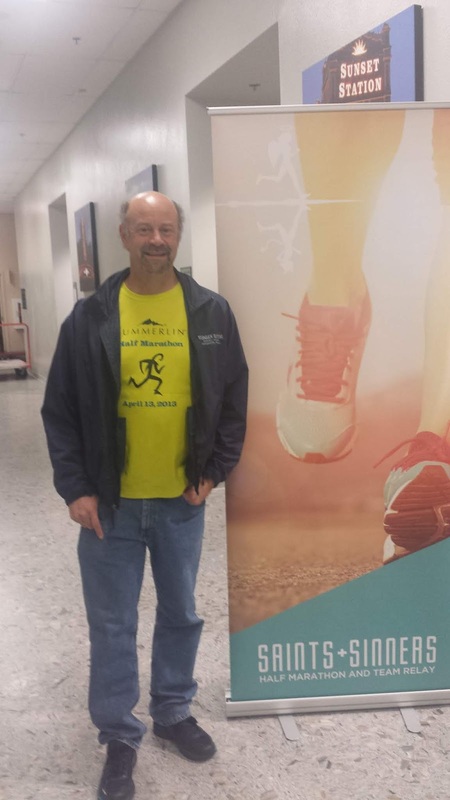 My last half marathon didn't go very well and to be honest, I wasn't feel "on". Also, my training hasn't really gone very well. I've been sort of slacking on long runs. So I wasn't expecting much as I toed the line for the 7:30 start. I started off cautiously and decided to run by feel. The first two miles are run in a residential area. There are a few turns as we make our way through them. The course was well marked and marshaled. I wasn't leading by any means, so I was just following the pack. It was a little chilly at the start. I had two shirts on, shorts and throw away gloves. I sort of regretted wearing two shirts, but overall I don't think I was overheating. When the course was shaded I wound up wearing the gloves and later I stuffed them in my pocket. They were a nice accessory to have. I wasn't too surprised to run my first 3 miles at about a 9 min / mile pace. I felt okay but I was wondering if my lack of endurance training would bite me and I'd start my crash and burn around mile 6. Eventually the course takes you out of town and you are surrounded by pastoral scenes. An LDS church spire, cows and horses baying in the background. It gets rural and bucolic. There were some rough sections of road and I twisted my ankle in a pothole. Luckily not damage was done. People were more spread out, but I was always within shouting distance of someone in the race. Just shy of mile 5 you hang a left. You go about another mile before you get dumped into a well-to-do neighborhood. This was my favorite part of the course last year. The smells of the desert are amplified here. Also there are a lot of modern houses that reminded me of New Mexico: the boxy desert house that were nestled on hills. It was tough going here but all the sites helped distract me. Finally just shy of mile 7 we reached the turn around. I couldn't be happier. I was still feeling good and I knew I had a solid of mile of downhill. It was nice to blast down that stretch. Instead of an out-and-back course, you continue to go down a stretch of road. There was a fair amount of traffic on the road, but we had a good shoulder to run on and I think drivers were aware a race was going on. I never felt like I was in danger. This mile seemed to go on for an eternity. 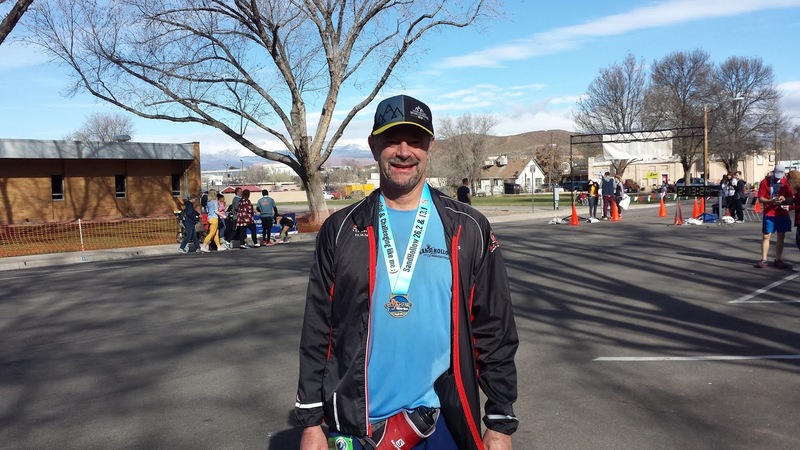 I didn't have anyone behind me and I was working off a guy who might've been in my age group. My goal was to hang with him as long as I could. However, during this stretch he started to fade and I found a second gear. I made my move and I think that sort of dropped his spirits. At some point, you rejoin the course where we had started. 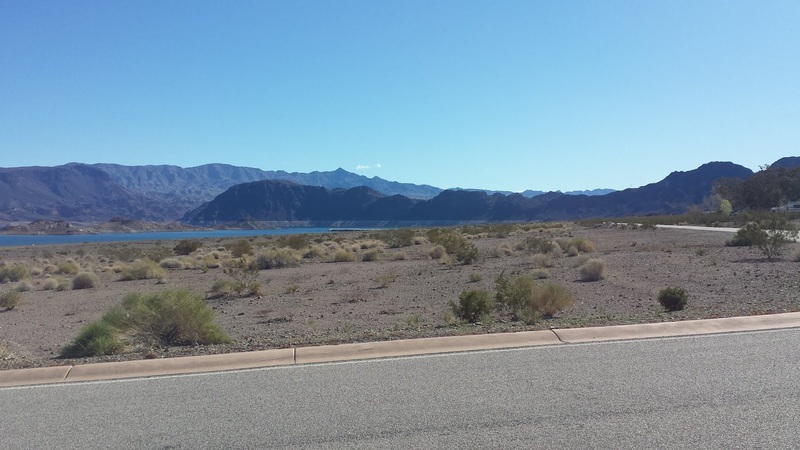 I had made mental notes of the first 3 mile markers from the distance from the start. I knew they were off. It was nice to know that when I passed the mile 3 marker, I really had about 2.9 miles to go. 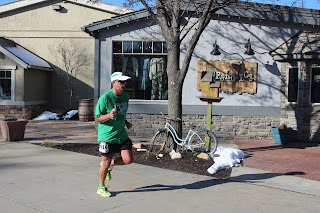 I got another second wind here as I was pushing myself in the final 5K. I wasn't dying and was actually pretty happy with my pace. I knew it wasn't going to be a PR day but I was actually going to turn in a decent time. The final half mile is a bit of a heartbreaker. You can see the finish line in the distance and it seems like you only have a little more to go, but in reality it's quite a ways. 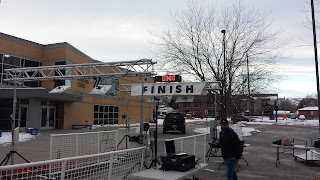 I wound up catching another male runner before crossing the finish line in 1:54. I was actually pretty happy with my time. 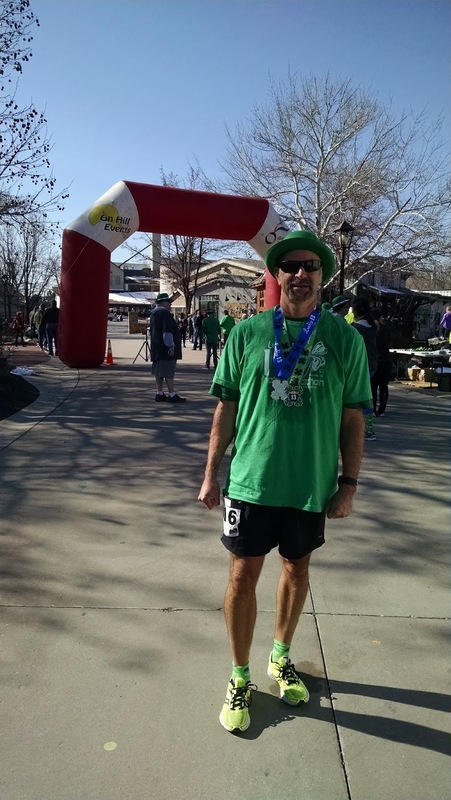 While I was a minute slower than last year, all things considered, it was a "win" for me. 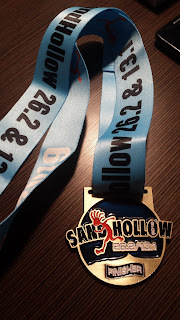 I had been sick for most of the month and my training hadn't gone well, yet I had finished a half marathon without going into a death march / I hate running mentality. 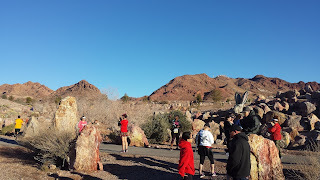 I wound up socializing with some of the other runners from Salt Lake. We all complained about the horrible drive down but were all ecstatic about the highly agreeable running weather. What was cool about this race is that I know the race director. I've done his race a few times and I always make it a point to say hello when I do the St George Half Marathon in January. He surprised me by making a promotional poster -- with my photo on it. It's a beautiful piece of work and I was flattered. He had a bunch of extras and I managed to bring a stack home. Totally cool and made my weekend. Post race refreshments included water, chocolate milk, brownies, fruit and pretzels. He even had some sodas. Overall I was really happy with the post race fare. I think everyone else was too. The mile markers were fairly close, but I think once again the course is a little short. Most people's Garmin watches reported a short course. I don't think anyone was complaining though. 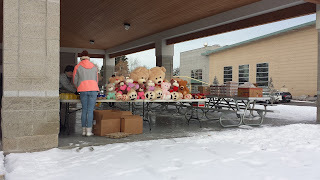 There were plenty of aid stations with volunteers. They had water and Gatorade. Some had gels and fruit. There were plenty of them and I probably didn't need to carry my hydration, but I prefer to be able to drink when I think I need to. And sometimes volunteers weren't ready for me, so I could afford to skip them. The medal was very cool. They had a decent shirt as well -- it was a cotton / tech blend. I am not sure I am fan of that but I think more races are starting to give them out. I prefer pure polyester for running. Overall, I was happy with my race experience. I am buzzing from a decent race performance despite not being 100% ready. The weather couldn't been nicer and I really enjoy the variety of the course. Well, I'll first start off by saying February was a pretty crappy month. 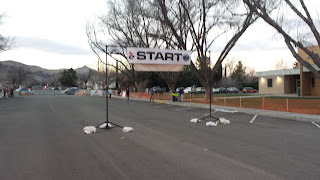 It started off okay but my training really took a nose dive after the South Davis Recreation Center 5K. 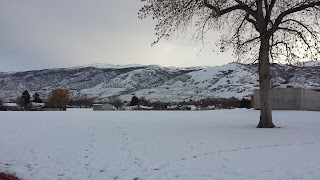 I normally don't mind winter running and while we had some rough weather, it really wasn't that bad. 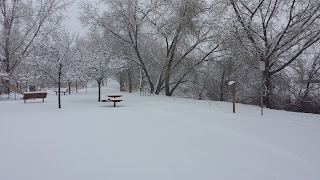 In fact, I don't think there was a day this winter where I couldn't run or that the bike trail wasn't in good shape. My problems started around February 10th when I discovered the cat I was feeding died. A few days later I got a nasty cold, which sort of morphed into bronchitis and then some sort of "para flu". Running suddenly became a lot harder -- especially when you can't really get a full breath of air or if you stop running you cough like an asthmatic. Here I am typing this in on March 2nd and I am still not 100%. So it isn't too surprising that I only got about 130 miles in for the month. Also as the month crept on, I get less and less quality runs in. Most just became maintenance runs. Some months are like that. 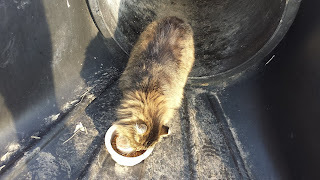 Despite the horrendous news that the cat I had been died, I continue to feed another feral cat -- a little black one. I don't see it very often but I do drop food for it and once in a while I find it sunning itself in the field, waiting (presumably) for me. Like Oreana, my other cat, we named her after a Nevada town: Fallon. The race season is under way. 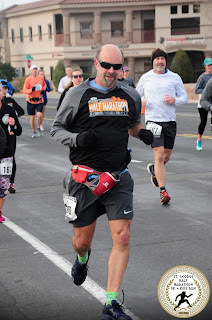 I did pass on the March Madness Half Marathon that was scheduled for 3/2. I dropped down to the 10 KM and decided at the last minute that I wasn't even going to be able to run that. 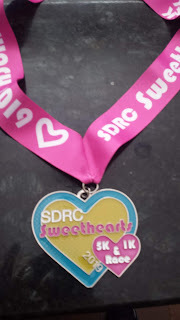 I hate to not run a race I registered for, but I probably did myself a favor. 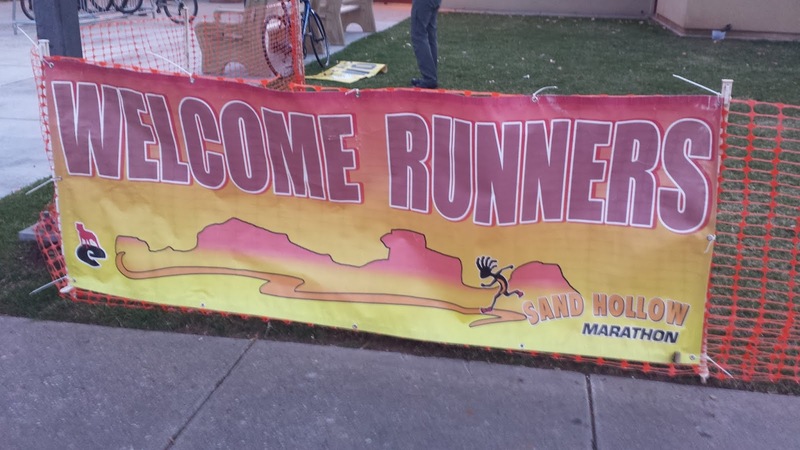 Hopefully I am 100% for the Sand Hollow Half. Well most readers of this blog know that I run regularly on the Jordan River Bike Trail. I live literally about a quarter mile from one of the parks and I pretty much run the same route at the same time every day. There is something nice about that. I know most of the "regulars" and feel like I am a regular. 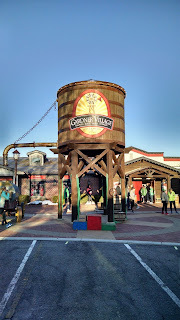 While, it doesn't offer much for training variation, it is a place where I don't have to worry about cars, there are bathrooms and drinking fountains and all around it is a solid place to train. Also the paved trail is level, so I don't usually get any hip problems. I've always had a fondness for pets and animals. I've had a dog or a cat for the better portion of my life. 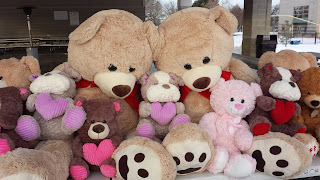 They make great life companions and even when you are having a crappy day, they can cheer you up. 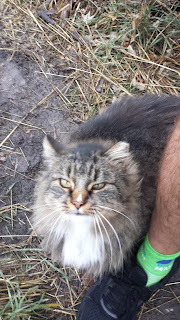 In the years past, while running on the bike trail, I've befriended many pets. In the past it was Snowball, a neighborhood cat that the owner's let wander onto the bike trail. I'd feed or stop by my runs to pet it. It knew me and was happy when I brought some kibble for him to eat. One day Snowball just vanished. The owner never knew what happened. My hunch is that someone thought he was abandoned and would make a nice pet. However, most animals on the bike trail aren't that lucky. There are several instances where pets have simply been dumped by owners who no longer want the pets. My current cat, Oreana, was one of those. 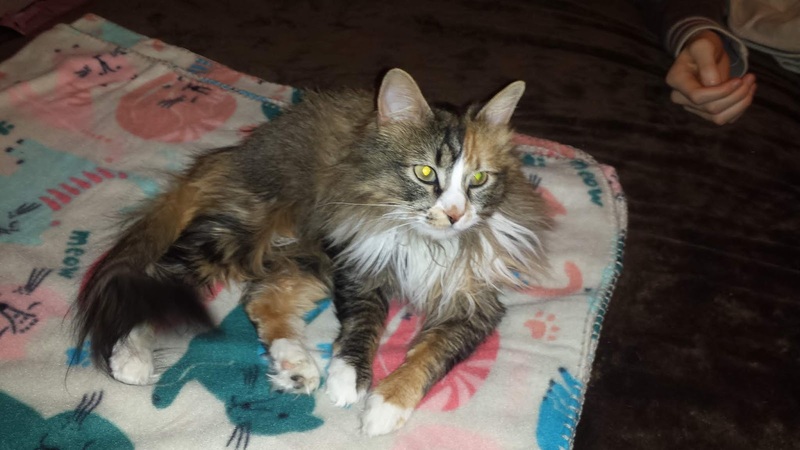 Luckily Oreana was easy to capture and she wanted a home. I think she has probably been the best cat I've ever owned. She loves to play, be pet, is clean and doesn't cause any problems. Around the time I was befriending Snowball I met whom I would later call Fluffy. I would say I first encountered Fluffy about 3 years ago -- maybe more. 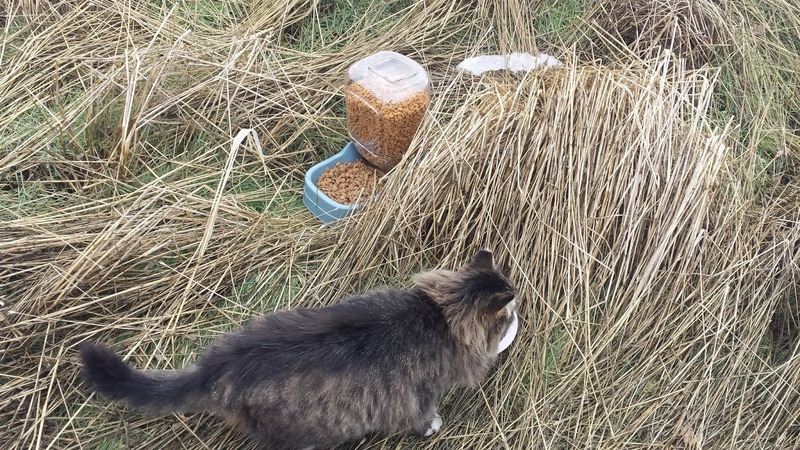 But it was a tiny cat I spied in the middle of the field who stayed far, far away from me. At the time, I carried cat food for Snowball and I had half a bag left, so I tried to make it obvious what I was doing and dropped some food. The next day, the food was gone. Fast forward over the course of a year or two and our routine got more settled. She was certainly hesitant to be near me but she knew my pattern and often times I'd see her a healthy distance away waiting and watching for me. 90% of the time I had food and I'd drop it. And every day the food was gone. Over the last year we firmly established a routine -- with just some variation in it from time to time. But every day, she was waiting for me at a storm drain. She wouldn't let me touch her or pet her. She'd wait in the tunnel, I'd drop the food, I'd back away 10 yards and she'd come out and eat. I could watch her, but I couldn't touch her. I was happy with the situation and felt bad for the cat. But there wasn't a whole lot I could do. Any attempt at catching her resulted in her backing away. I certainly didn't want to get bitten by a feral cat (think rabies). But I continued to feed her over the course of the next 12 - 18 months -- religiously, every day. 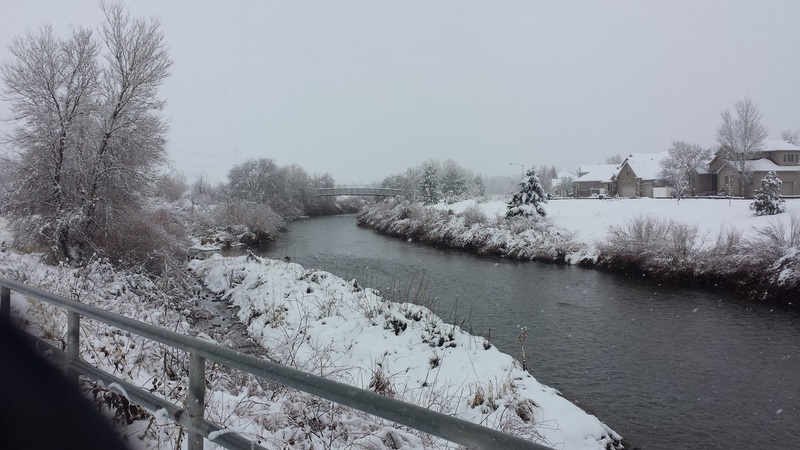 It gave me motivation to walk or run down to the draining ditch. It was a good 1.25 miles from my house (one way) so even on rest days, it was a healthy walk. Also, on days where I didn't run and was going on a weekend trip, before we hit the road, I'd swing by and dump food. Since we had a schedule I upped the portions, more kibble and even introduced wet food. And she gained weight and was actually really healthy. When I left for Arizona in May of 2018 I was really bothered. I was going to attempt to start a new life down there and make a go of it. But what I was I going to do for this cat? It was a feral after all and it wasn't my pet but it was a daily task. There were a few other people on the bike trail that were willing to lend a hand but I suspect their interest in helping out long term was probably weak at best. Luckily, while I was gone, Shari fed Fluffy. 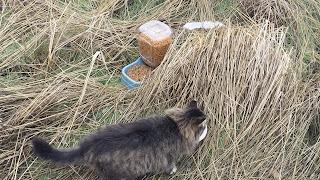 She was just as diligent as I was in getting the job done and drove out to the drainage ditch, walked from the parking lot to the meeting place and dumped the food. Most of the time, Fluffy was waiting, sometimes not. Around July of 2018 I decided that Arizona and I were not going to work out. Just a variety of reasons made me realize that Salt Lake was my home. Naturally when I came back, I resumed my normal running routine -- and of course I took over the duty of feeding Fluffy. The first few runs I didn't see her at all. I knew she was around but sometimes our patterns just didn't line up. But then I did see her. Not at the drainage ditch but at another spot on the trail. She immediately remembered me and despite being in an open field, she approached me. And the magic happened. She rubbed against me and let me pet her. 3 years in the making -- I just about died with excitement. I gently pet her, spent some time with her and dropped some food. I thought-- wow this may not be a feral. This may be a cat that I could adopt and bring home. But would it be litter box trained? Would it get along with Oreana? would it destroy my house? How would I capture it? Did she want a home? Over the next 6 months it was the highlight of my run. I'd stop, pet my cat, and she'd rub against me and meow and it was as if she was mine. She was always skitish of me but I was free to pet her and eventually hold her from time to time -- but not for long. I do remember once she got under my feet and I accidentally stepped on her paw. She gave me the cold shoulder for a week and it took me a long time to earn her trust again. But it happened. 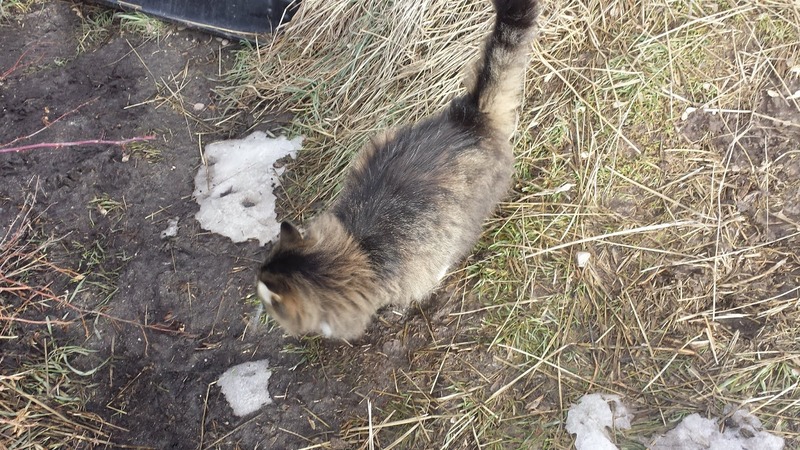 Eventually we switched back to the drainage ditch and she was getting fatter and bigger. Before winter set in we decided we'd make an attempt at capturing her. We'd give her a go in our house. If she destroyed it or beat up on my other cat, we'd just bring it back or take her to a shelter. But we both wanted her. I certainly wish I could've explained to her what I wanted to do but she wasn't having any part of being picked up in a blanket or put in any sort of box. We tried about half a dozen times and each time we tried it we learned what worked and what didn't. Our last time, we got her in the box but couldn't get the lid on fast enough, so she jumped out and just gave me an icy stare. I didn't want to try too many times to get her. If I tried every time, she'd never trust me and I'd rather feed her than scare her off. Well dear reader, you probably know where this post is going and how it will end. 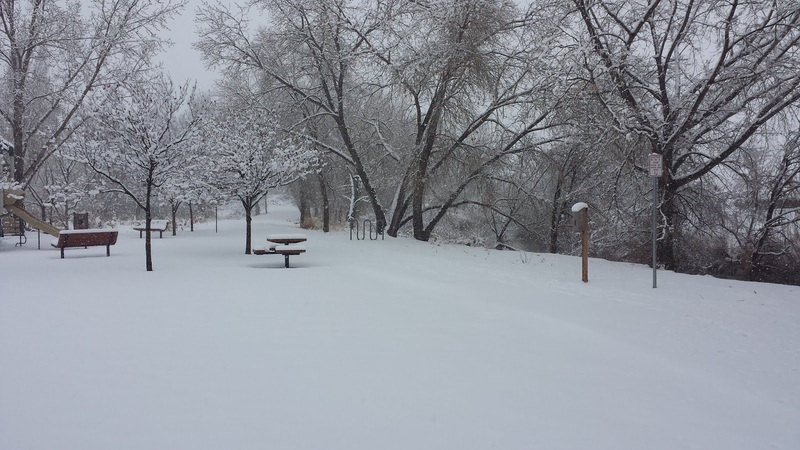 But we had a winter storm coming in and I of course went for my second run of the day. I had fed the cat in the morning on my long run but decided that at 4 PM I could afford to eek out another 3 miles and feed her again. Of course she was there waiting for me and it was windy and cold. I held her against my body and she just accepted my warmth. Normally she squirmed and escaped my grasp after 10 seconds, but this time she just was content for me to hold her. I knew the weather was going to be bad and she was a trooper at surviving harsh conditions. We've had far worse storms. If I had had my phone with me I would've called for Shari to come get us. So with some misgivings, I gave her a final hug and set her down. 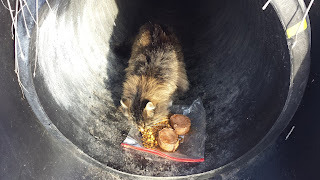 She dove into her food in the shelter of the tunnel. That night the weather was horrible. It was snowing sideways -- not a lot. I think we got about 3 inches of snow, if that but it was windy. I kept thinking about Fluffy and wondering if I should go get her. But it was dark and my hunch is that she was hunkered down somewhere. On Monday, after work, I went for my run and came across the spot where I feed her. I called out for a her. I had a panicky moment. I mean come on, we didn't have that bad of a storm last night. She was a survivor and a fighter with a full coat of fur. There was no way that storm got her. I called out again and sort of poked around the usual spots where sometimes she liked to hang out. I looked down at the banks of the Jordan River and there was Fluffy. I don't think I'll ever know what happened. She wasn't covered with snow and there were a bunch of tracks down near the river bed. Perhaps hers, perhaps a dog. There was also a set of human prints that led to her. She was laying on her back, partially on some brush and there was evidence of blood. She wasn't mauled. There was virtually no snow on her body. Her lifeless eyes stared back at me. I was simply too late and I had failed to rescue her. I hit my knees. It was as if I had been kicked in the stomach. I looked again at disbelief but I could tell it was her. She had the hugest white paws I've ever seen on a cat and there they were. I wanted to throw up. I didn't have a phone with me and I just backed away and believe it or not continued to run. I was trying to hold back the tears and finally after another mile or so I pulled off at a park, sat on a bench and wept. I called Shari and later we drove out to her with a shovel and the box we had been trying to use to bring her home and got her dislodged from the tangle of brush she was in and brought her lifeless body to the vet. It was a tough thing for me to do as I tried not to cry and throw up with all the memories of our time together. It was a 24-hour vet so the cost of getting her remains was double what it should've been. I paid for the service and went home. Part of me was in shock that I'd pay that kind of money for a silly feral, but the more I thought about it, the more I realized Fluffy was my pet. 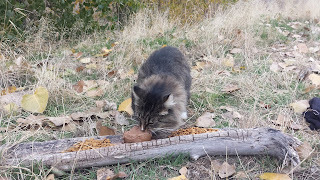 I had a ton of people ask me why I did it, why would I feed a feral cat who showed me no attention. It was a total one way relationship at the start, but the process made me feel good and gave me satisfaction of making a small difference. Running, since then, hasn't been fun. I still stop by the drainage ditch and call out. I think to myself, maybe I made a mistake. And for a while I thought I heard her meow like she used to when we saw each other. But it was the wind or a bird. There is another black cat that periodically is there, so I've been feeding that one now. It doesn't even like me to look at it and I've been feeding it for a while. I think it got the leftovers that Fluffy didn't eat (I was brining two cans of food each day). It'll just take some time to develop a schedule with it, but on warm, sunny days, I find it sunnying itself on the banks. I don't know what happened to Fluffy. And to be honest, I don't really want to know. I began to look at strangers walking along the bike trail, wondering if they had done something to my cat. A lot of things don't add up and I don't think she died from the cold. We got a fair amount of snow so I would think that if that had been the case, I would've found her in some sort of shelter-like position and not on her back. I also don't think a wild animal got her. Her body was too intact. I am still mad at myself for not being able to rescue her. I say to myself I should've tried harder or I should've been more aggressive. But there were so many variables at play. My runs no longer really have the same meaning and while they are getting easier, I still look to check the draining ditch and see if she is sitting on her favorite rock, waiting for me. I thought about switching routes, but I can't. I am a total creature of habit. And besides, I have a black cat to feed now. All I know is that this one stung and it stuck with me. 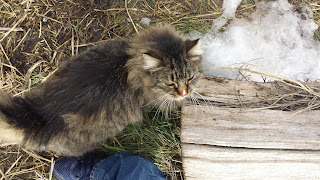 At simple as our relationship was, Fluffy was my pet and I may have been the only one to ever show her kindness. I think because of me she was able to be happier and more well fed had we not met at all. 13 11:22 A bit of downhill then up. I had nothing left here. Last year, I did the Saints and Sinners half marathon and generally had a good experience. 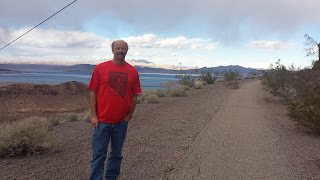 It is in one of my favorite places to run: The Lake Mead Hoover Dam Train Trail. 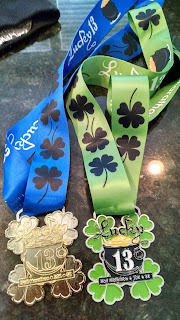 I don't think I was going to do it this year on account it is a destination race for me and let's face it, I've done it before (as well as another race, the St Patrick's Day run) along the course. But sometime around Christmas they had a flash sale and their semi-steep price turned into a good deal. I think I squeaked in for around $60, which isn't too unreasonable for a race (for whatever reason Vegas-area races tend to be expensive). So sometime around the new year, I got my ducks in a row, booked a hotel and got excited about the race. Well, the problem is I didn't get excited about the race. A few days before the race, I got my annual cold. This cold wasn't one of those blow your nose / whine in bed colds. It was very mild but it did leave me out of breath easily and coughing like a 2-pack-a-day smoker. To compound matters, I jumped a curb a few days before the race (while running of course) and pulled something in my groin area. I was literally limping around 24 hours before the race: step with the left, drag with the right. So I was taking anti-inflamatories and cold medicine. Not a good combination. And finally, I had to deal with some emotional issues early in the week (a post forthcoming on that). So to say the least, I did NOT feel like running -- at all. I woke up Saturday morning and my groin had resolved itself -- miraculously. I was coughing but I felt reasonable. I figured I might as well run it. 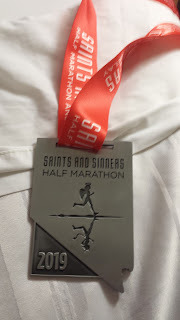 The Saints and Sinners organizers have good medals and I paid for the race. I knew it wasn't going to be pretty though, but sometimes miracles do happen. and the running Gods smile down upon you. I got dropped off at the race and I milled about for 40 minutes before the race talking to people and psyching myself out that I could actually run 13 miles while feeling like crap. The race started a few minutes late (it took a while for everyone to make their way to the starting line from the runner assembly area). And soon we were off. The first quarter or half mile I was hemmed in. 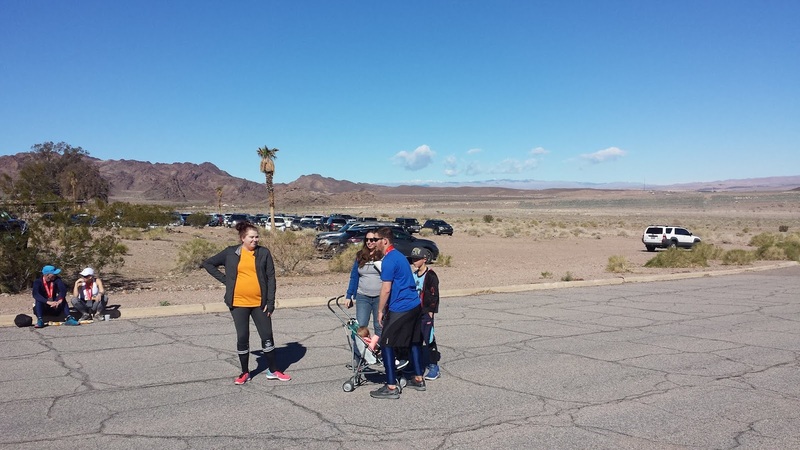 There were a ton of runners and we were on a paved standard issue bike trail (about 7 feet wide). Most people had lined up according to speed but there were some that clearly hadn't gotten the message. It wasn't the end of the world... .I was sort of feeling myself out and after a few initial twinges, my groin behaved itself. I told myself that if I felt like crap early on, I could just walk off the course and call for a ride or hoof it back to the hotel. The first 3 miles are a delicious downhill. I wasn't working too hard and I let gravity pull me down. My breathing was controlled and believe it or not, I felt okay. My head, although was cloudy and humming from a week's worth of cold medicine and my legs just felt tired despite having nearly 4 days of no running. The air temperature was warming up too. While it never got over 55 that day, it did feel warm and it seemed like I was working up a good sweat. I looked around and a lot of runners were wearing winter clothing -- they would pay for that later in the race. 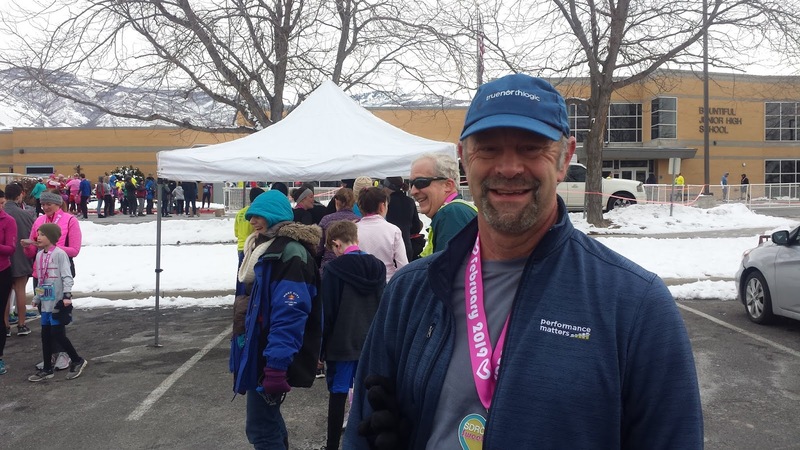 I was in short-sleeves, shorts and throw away gloves, which I pocketed a mile or two into the race. The first reality check is around mile 4. There is a decent hill and suddenly you have to actually "run" instead of coast. It was at this point I knew it was going to be a rough race for me. While the hill is only about 40 feet, it definitely took its toll. There is an aid station at the top and luckily the run goes downhill for another two miles. The descent at this point is much more mild, and I was able to return to a normal half marathon pace. 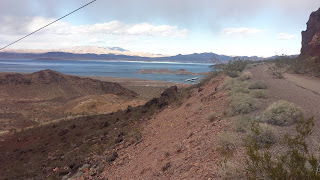 The bike trail zigs and zags its way down the main drag of Boulder City and you are treated to some awesome views of Lake Mead. Traffic was well maintained and while the course was steep at times, you were never running out of control. About the 10K, when the downhill stopped, I knew it was going to be a grueling run to the finish. I just felt really off, demoralized and out of energy. I tried to cheer myself up by looking at the views, but simply put, I didn't feel like running. Also at this point you change from the bike trail to the dirt "rail trail". The footing is easy and while technically a trail, it is as smooth as can be. It is also a little hard to get any traction and get a bounce from the rebound, so my pace suffered here. You are still treated to some stunning views of Lake Mead and the surrounding cliffs. You also get to run through the tunnels, although unlike last year's race, you only got to run though two of them. The park service decided that one of the tunnels needed repairs and closed it to public access. I couldn't wait until the turn around, which happened around mile 8.5. There were still plenty of people to run with so I was never entirely alone during the race. Although it was humbling to be passed as my pace suffered with each mile. I kept telling myself, I was finally in the homestretch. My legs just felt like lead and I really didn't have anything going for me. While my Garmin was chirping at 9:30+ miles I felt like I was running 10-11 minute miles. After getting off the trail, I could see the finish line -- way in the distance. I still had a solid 4 miles to go, but at least the next two were a gentle, paved downhill as we resumed running on the bike trail. The final mile I was mad at myself and I was going over in my mind how much I hated running. I don't really, but that is the way I felt as I shambled along. I just had nothing left. Due to the tunnel closure we had to run past the finish line for about .53 of a mile (downhill) and then turn around and make our way back to the top. It was so frustrating to hear the announcer saying everyone's name and the finish line music. There used to be a day when I would've been long done by now. To be honest, I longed to just cut the course. I pretty much dragged myself back and made the left hand turn towards the finish line. Around mile 13, I dug deep and made a bit of a sprint to the finish -- you know -- so it would look like I wasn't dying when I crossed. 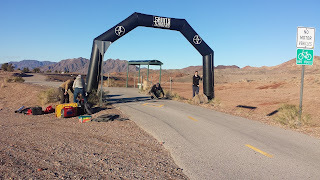 You get to cross under one of two finish lines, a white saint banner or a red sinner banner. Of course, for the second year in a row, this heathen ran through the sinner banner. After the race I walked off the post race nausea and looked around for anyone I knew. Being I was nearly 400 miles from home, I didn't. But I grabbed some water / gatorade. I couldn't stomach any food but they had fruit, cookies and typical post race food. On some level I was happy that I had "survived" the race. Shari was begging me not to run it and in all honesty, I sort of excited my expectations -- I sort of felt like I was going to be doing a fair amount of walking. 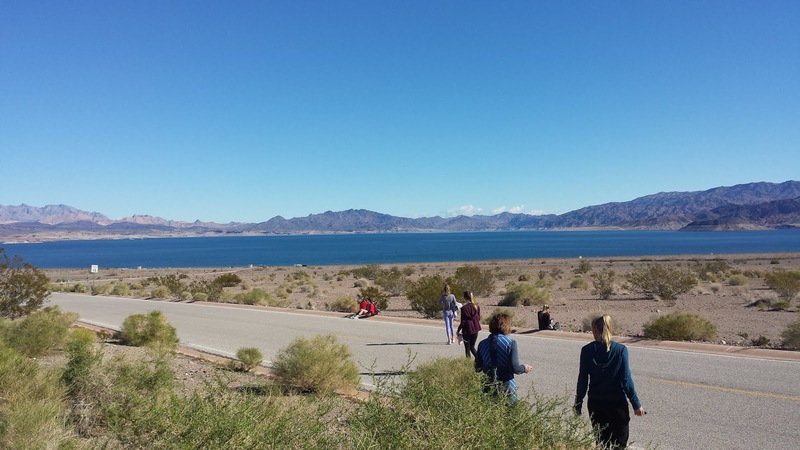 The original plan was for me to run back up to the Lake Mead Park's pay entrance and Shari was going to pick me up. That was about a mile run / walk. I didn't have much left and my motivation to run was nil. Luckily they did have a shuttle that ferried people back to the starting line (where 99% of the people parked their cars). I hovered near the shuttle until it was nearly full and grabbed one of the last seats. The finisher's medal is a gem. It is heavy duty and large. Plus it is in the shape of my favorite state. This one will likely go down as one of my favorites. The shirt's colors were kind of a mish-mash (I am wearing it in the second photo). It is hard to read but overall a standard issue tech shirt. I will definitely wear it. I like the course but disliked it this year on account of the grueling half mile out and back at the end. 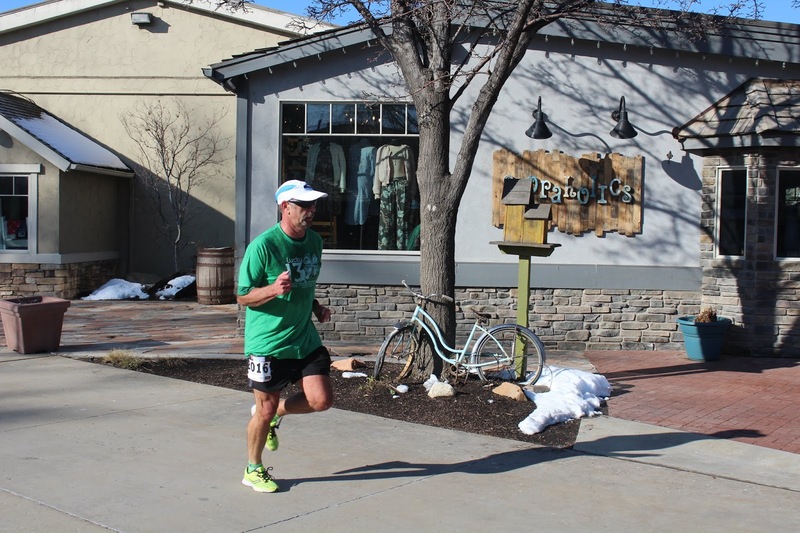 This wasn't the race organizer's fault by any means but it was my least favorite part of the course. The mile markers seemed to be off a bit at the start of the race and about half way through started to sync with my Garmin. Not the end of the world though. 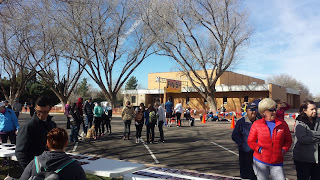 The aid stations were properly manned with enthusiastic volunteers. I think there were more aid stations than advertised, so that is always a plus. This was definitely not the race I wanted to have (again no fault to the organizers). When I registered for this race I was going to use it to really get a decent time. The course is fast, especially with the elevation profile. I think given the conditions and motivation to run, I could've done a LOT better here. But with all kinds of variables stacked against me, I got the expected outcome. And worst of all, I was significantly slower than last year. Will I race this next year? Perhaps. I like the race a lot and especially the course. If they send out another special offer to save I will likely do it again. One of the best bargains in town is to do the South Davis Recreation Center races. They are very affordable, well run and it would seem like you get way more for your money than other races. I got a special deal to run this one and I took advantage of it. 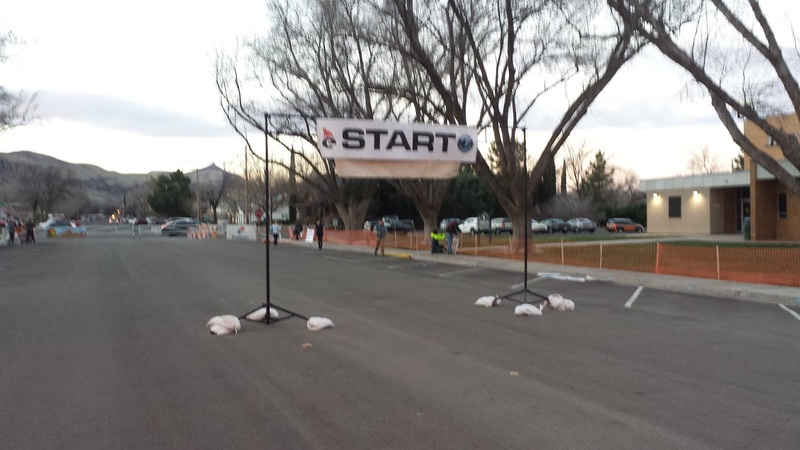 This 5K course is the same one used for their Handcart Days 5K and Thanksgiving day 5K. I've probably raced this course at least a dozen times by now. The race is located about 25 minutes north of my home. There is ample parking and best of all, a recreation center to hang out in before the race, so you can stay warm and use clean / warm restrooms. I arrived at the race site about an hour before race time. 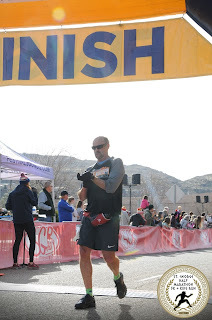 I quickly got my bib and killed some time waiting for the race to start. About 20 minutes before the race I did a very brief warm-up and some dynamic exercises to get ready. The weather for the race was ideal. Virtually no wind and with temperatures in the low 30's -- probably 32F. When I had arrived it was 26 but it warmed up somewhat nicely. I was dressed in shorts, long sleeved shirt and heavy duty gloves (I hate cold hands). As I was waiting for the race to start I decided to ditch the jacket. I just tossed it behind the starter's area and said I'd get it after the race. Smart move on my behalf since I heated up quickly. The race started on time and the first 100 yards or so it took away to find some running room. It is a bit of a family event and and there were some folks there that were fairly new to racing. It wasn't a big deal but it is something to expect. 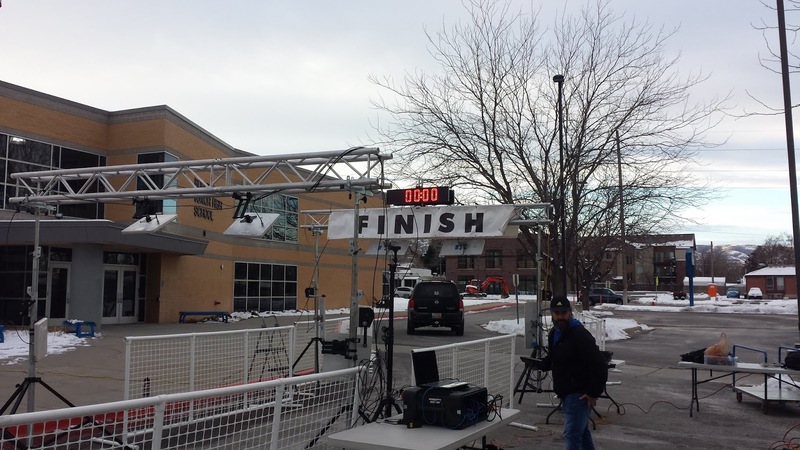 The race starts at the recreation center and runs north for about a mile along a residential street. It is a gentle downhill at this point and I wasn't too surprised to see myself clock a 7:45. I was a little worried about it because I know the race gets more challenging on the way back. Either way, I felt good about the first mile. 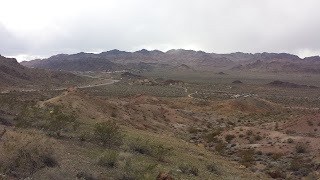 After about 1.25 miles, you hang a right and you are greeted with a quiet road that gradually goes up. The hill isn't awful but it definitely takes a bit of the wind out of my sails. You hang another right and you are brought out to the main drag of Bountiful. There are some houses and a fair amount of traffic on this road. Luckily for a Saturday morning, it wasn't that bad and they had the larger intersections manned by volunteers or the police to ensure you could get through. This mile is always the toughest. The hill is way more noticeable and at this point in a 5K, you are hurting. I felt like I was running faster than an 8:15 when my watched beeped at mile 2 but it was right on target in terms of what I figured I was going to get. As I climbed the hill, I remained focused on maintaining good form and knowing that the sooner I got up the hill, the sooner I could get to the flat section and cruise to the finish. The final .20 of a mile is flat and as you round the final corner you can see some the spectators cars and you can almost smell the finish line. I had a lot left at this point and really dug deep to knock off a few seconds off of my time. No one was behind me and there were a few in front of me, but they were turning on the jets too. As my Garmin chirped at mile 3, I looked down and figured I'd have a shot at a mid 24 minute run. This would certainly meet my stretch goal of 24:30. Maybe I could do it. You make one final right hand turn and the finish line is just a little ways away. Here it turns into a sprint and while I pushed it to the finish, it wasn't like anyone was going to pass me or I was going to pass them. The finish line time wasn't working and as expected, the finish never comes soon enough. My goal of a 24:30 wasn't met, but I wasn't too far off. After finishing the race I grabbed a finisher's medal and did a cool down back to the starting line. They were cleaning up the starting area and thankfully, my nice jacket was laying just where I left it. I put it on and got to my car and grabbed a camera and went back to the finish line. 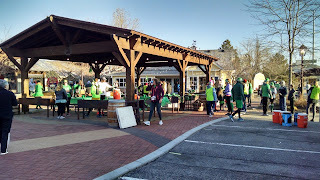 They had typical post race food: slices of muffin-like cake, fruit (oranges / bananas) and hot chocolate and other cold beverages. I grabbed a little food and got my official result from the timer and took off soon afterwards. I paid $15 (I think) for this race. With the service charge, I was in for about $20. I got a nice finisher's medal, an opportunity at some slick prizes, a supported course and a cool t-shirt. One of the few bargains in the running community. The course was marked well and started on time. Results appeared accurate as well. Overall, I was pretty happy with my time. I didn't have very many great 5Ks to wrap up 2018 but it was nice to start off with a fairly decent time (for me) to kick off 2019. I felt fairly strong but my overall raw speed wasn't there. Probably because I am a bit heavier than in my hey-day. This race is well suited for beginners and those looking for a nice, low stress 5K. 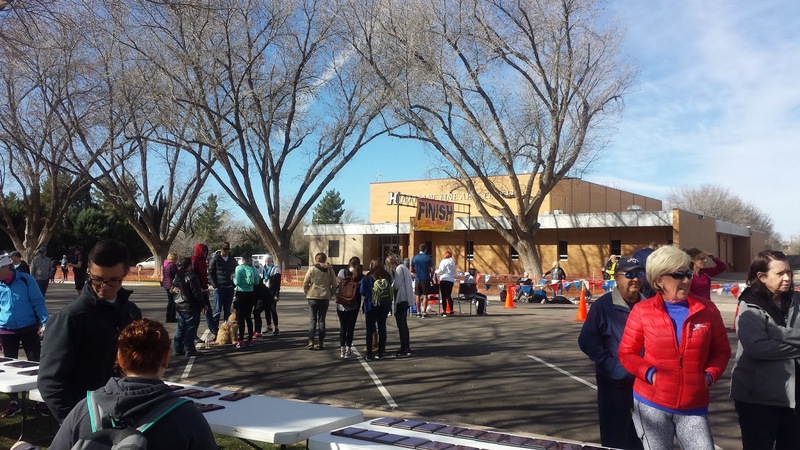 It is a great community event and I always appreciate what the South Davis Recreation Center does for their races. Well I am off with a new year and some new resolutions for the year. Normally I don't make any resolutions on new years and look at any given time as a chance to make improvements on my life. 1) I am working with a coach. I've been around the block a time or two. I know the difference between a repetition and an interval and the difference between a fartlek and a tempo run. I just need someone to make a few tweaks to my routines. For now, it will likely be a one time consult. I live too close to the bike trail and driving anywhere after work just won't do it for me. 2) I've cut my long run down a bit. This should keep me a bit more fresh during the week instead of constantly recovering from 16 miles. So far, despite some decent weather, I've been holding it back to 13 miles. It keeps me ready for a half but I am not burned out the rest of the week. 3) I am actually doing speed work: at least once or twice a week. 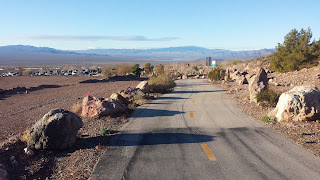 This past week I did a series of quarter mile repeats and weekly since the start of the year I've been doing 6 - 8 hill repeats up that hill you see. The first week I did I thought I was going to die. Each week, it has gotten progressively easier. My weakest thing for running is uphills and maintaining a consistent pace from start to finish. Part of the joy of running is doing weird / fun things. Sometimes it even proves to be useful. On Martin Luther King day it snowed in Salt Lake City. 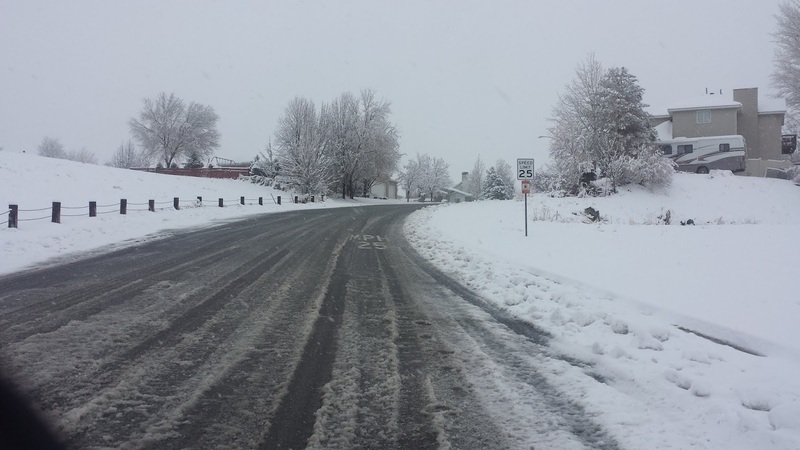 Not a lot -- maybe 3 - 4 inches, but it made driving treacherous. I had the day off and I was going stir crazy. Unfortunately, we also had a package that HAD to get out overnight. I certainly didn't want to drive there given the yucky weather, so what was a runner with cabin fever going to do? 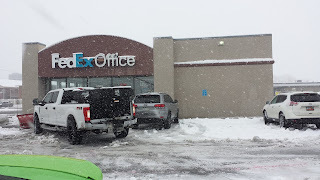 So I put the parcel on my back in a waterproof sack and ran the 3.1 miles to the Fed Express Office. I was a site to see for sure. I didn't care about my pace. I just needed to be safe in regards to watching for people who were driving too fast given the conditions. I made it there and back. The things we do out of the ordinary are always the most memorable. While the conditions weren't exactly life threatening or even dire, it was an adventure. I continue to feed the cat every day. Even when I leave town, I try to accommodate for her. She is there every single day. So on days I don't even feel like running, I know I have to get out there and feed this cat. We have tried a total of 5 times to gather her and bring her home. We learn something every time we try. But this cat doesn't really want to go home and sadly you can't explain that you are offering her a better life where she won't have to fend for feed, hide from predators and have someone to care for her. Also, her hiding spot is about 200 - 300 yards away from the parking lot, so just getting her to the car is a battle. I am hoping to get her soon as I have a road trip to the Saints and Sinners Half Marathon in mid February. Taking her in, still would be a bit of a trial run. She'd have to be house broken and get along with our existing cat.